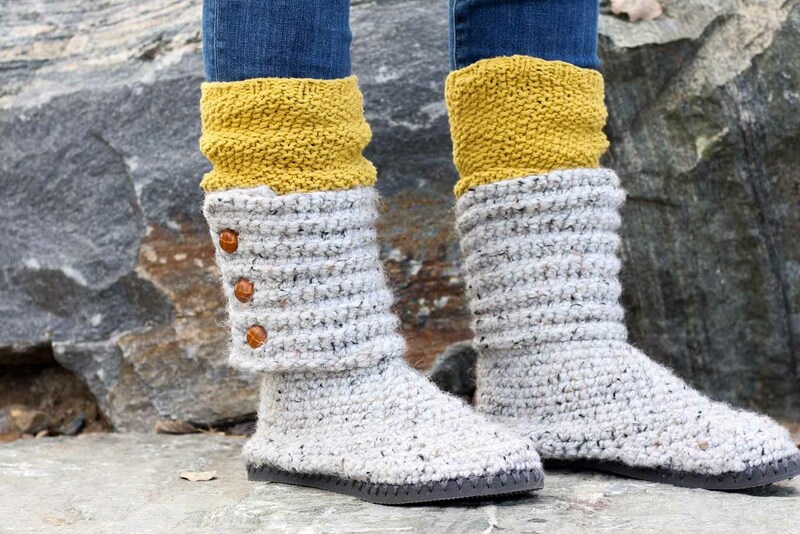 You’ll be a DIY goddess of cozy with these crochet boots with flip flops for soles! They make excellent slippers or UGG-like sweater boots to wear around town. 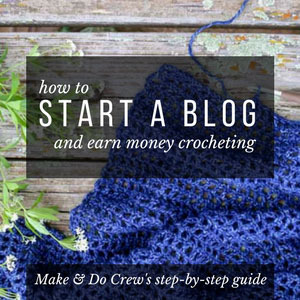 As always, you’ll find the free crochet pattern and video tutorial below or you can purchase a convenient ad-free, printable PDF for $2.75 here. I went to college at the University of Colorado in Boulder. It’s pretty much everything you might imagine. Incredible views. Hippie kids. Yuppie kids. And kids (a lot of them) who literally wore flip flops all year round. Yes, in the snow. Yes, when it was three degrees. Blame it on the snowboard culture, or the need to rebel, or sheer stupidity. Well, today I offer a little more practical alternative to the students of CU Boulder and everyone else who loves to wear flip flops. Crochet boots with flip flops as soles! I knew the cozy factor would be high on these when I started designing them, but honestly, wearing them is like a yarn dream come true. They combine the freedom of flip flops with the snuggle of chunky yarn. Winning! 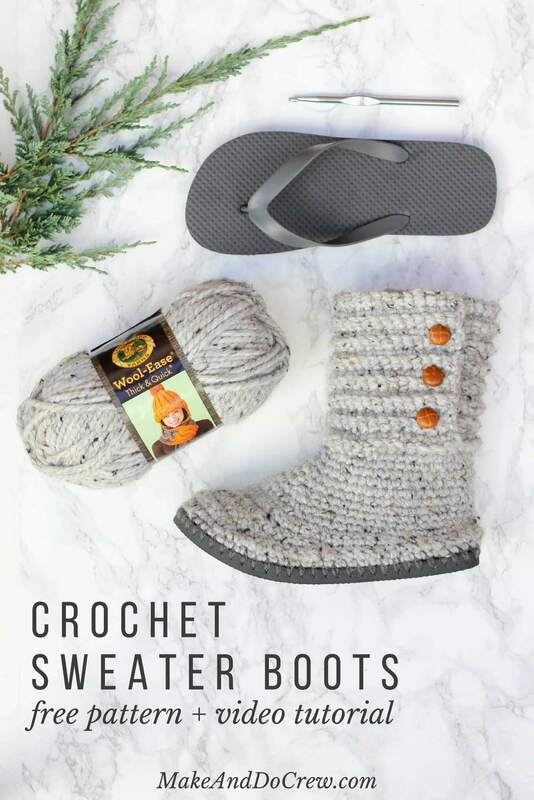 I’m thrilled to be adding these crochet boots with flip flops to the mix because not only do they look like crochet UGG boots you’d buy in a store, they also will work as legit shoes for the winter. (And if you like the look of UGGs, be sure to check out my free Breckenridge Boot flip flop patten as well.) 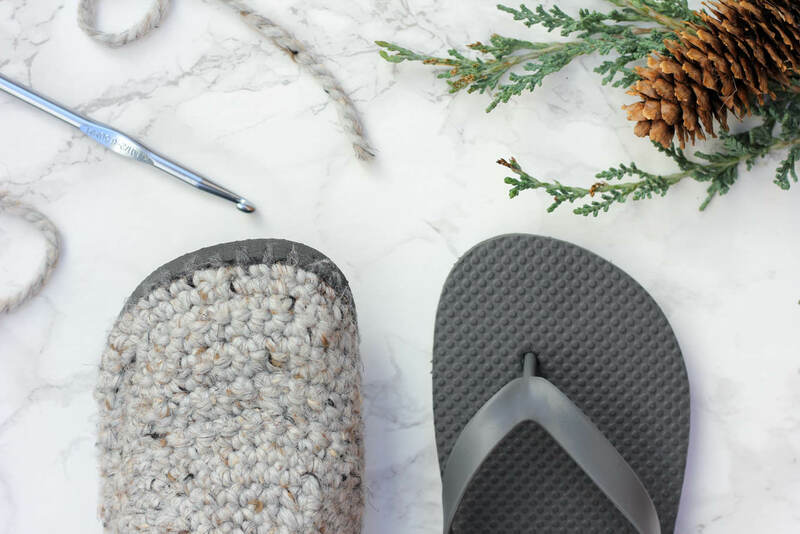 Some creative readers came up with the idea to glue the round “plug” from the flip flop straps back into the sole, which ensures that your flip flop sole will function pretty much like any other knit boot sole would. Whether you wear them outside as boots or inside as slippers, you’re going to have some incredibly warm, stylish and happy toes. UPDATE: Many readers have asked how these crochet boots with flip flop soles hold up over time. I’ve answered that question (with photos!) and many more in my FAQs about crocheting on flip flops. This crochet sweater boot pattern is a collaboration with my friends at Lion Brand Yarn. This post contains affiliate links. NEW! So if you’ve made any of my past flip flop crochet patterns, you know that the distance between the holes you poke in the sole has a big impact on how the gauge of your shoe turns out. That is why I’m really excited to share that the inexpensive, printable PDF of this pattern now contains a “ruler” to guide your hole poking. The ruler helps ensure you have the perfect number of holes to achieve the gauge regardless of what size flip flop you use. Please find the video tutorial and free written pattern below. Even if you prefer to learn by video, you’ll want to have the written pattern handy because the right and left ankle sections vary slightly. If you prefer crocheting on the go (or on the couch! ), you can purchase the ad-free, printable PDF of the pattern here. It’s great for mobile and tablet viewing too. Gauge will vary a bit based on distance between poked holes on flip flop sole. Use the “ruler” in printable pattern if you want to ensure gauge. Transforming flip flops into slippers isn’t an exact science! 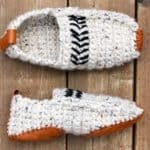 Unlike other crochet patterns, these slippers have some variables, most significant of which is the size of flip flops used and the number of holes poked. Use the “ruler” that’s available in the printable pattern if you’re struggling with hole spacing. The flip flops pictured are a women’s size 7-8 and they have 64 holes poked on each sole. To make shoes with bigger or smaller flip flops, just adjust the number of holes, poking them slightly further apart than every 1/3 inch. Find inexpensive flip flops on Amazon or at Walmart. Dollar Tree’s $1 flip flops tend to be a bit too flimsy, but can work if you are careful. Pattern explains locations on the flip flop as if it’s a clock where the top of the toe is midnight and the heel is 6:00. • The base of the boot pattern is crocheted tightly, similar to amigurumi. Make a deliberate effort to keep your stitches tighter than you might usually. Check your gauge if you’re unsure. • If at any point your boots are feeling too roomy, watch part 3 of the video tutorial for suggestions on how to make them better fit your foot. SC Round: Using Size B hook and SC, sc in each hole around sole, join with a sl st to first sc. Fasten off. Using size medium-sized (K) hook and MC, join to previous round with a slip stitch at position 11:00 if you’re right handed and position1:00 if you’re left handed. Foundation Round: Ch 1, sc in each sc around, join with a sl st to first sc. Do not turn. Place marker at position 6:00 at back of heel. Row 8 (WS): Ch 1, sc in each sc of Row 7; sc2tog, sc in each sc to marked st, turn. Round 9 (RS): Ch 1, sc in each sc of Row 8; sc2tog, sc in each sc to 1 st before marked st, hdc in next sc, dc in marked st, sl st in last st of Row 8 to join. Do not turn. Round 10 (RS): Ch 1, sc in each sc around, sl st to join. Place markers at positions 10:00 and 2:00, with 8 stitches between them. The following rounds are worked without turning. Round 18 (RS): Ch 1, sc in each sc around, sl st to join. Place marker at position 8:00. Use largest hook (L). Row 20 (WS): Ch 1, scblo in each sc to marked st, (remove marker), ch 8, turn. Row 21 (RS): Sc in second ch from hook and in next 6 ch, scblo in each sc across, turn. Row 22 (WS): Ch 1, scblo in each sc across, turn. Row 23 (RS, Buttonhole Row): Ch 1, scblo in next 2 sc, ch 1, sk next sc, scblo in each sc across, turn. Row 24 (WS): Ch 1, scblo in each st across, turn. Rows 25-26: Ch 1, scblo in each sc across, turn. Place marker at position 4:00. Use largest hook (L). Row 19 (RS): Sc in each sc to marked st, ch 8, turn. Row 20 (WS): Sc in second ch from hook and in next 6 ch, scblo in each sc across, turn. Row 21(RS): Ch 1, scblo in each sc across, turn. Row 22 (WS): Repeat Row 21. Row 23 (RS, Buttonhole Row): Ch 1, scblo in each sc to last 3 sts, ch 1, sk 1 st, scblo in next 2 sc, turn. Row 27-34: Repeat Rows 23-26 two times. Attaching Buttons: Sew on buttons, ensuring ridges in ankle section appear lined up when boots are buttoned. 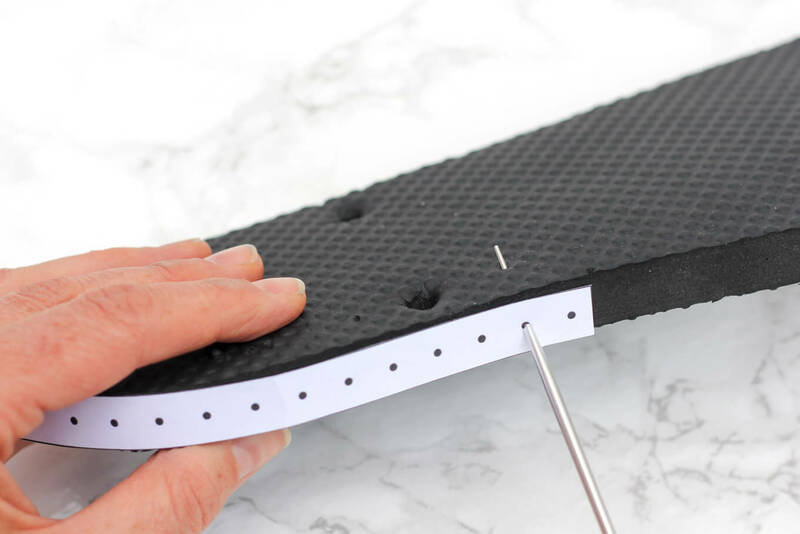 Plugging Flip Flop Holes: If you’d plan to wear your boots outside, consider gluing the small rubber circles that connected your flip flop straps to the sole back into their original holes. 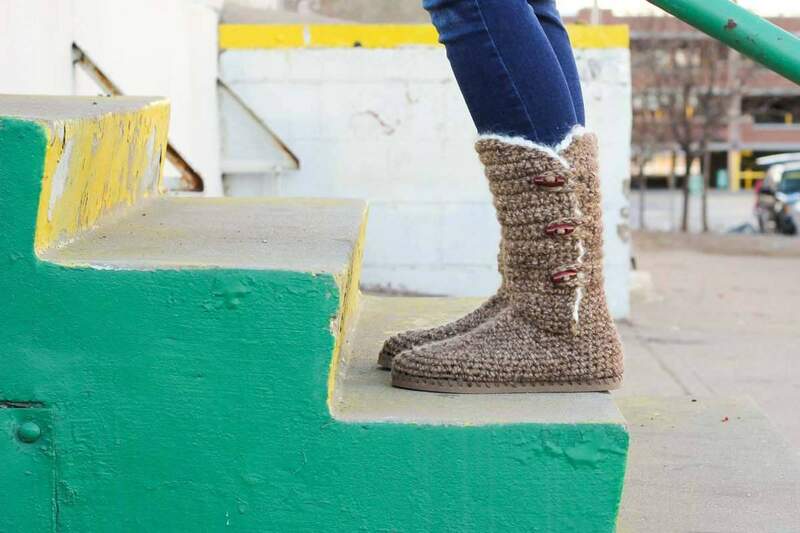 Fancy Feet: Tap those cozy toes together because you just crocheted your own sweater boots! 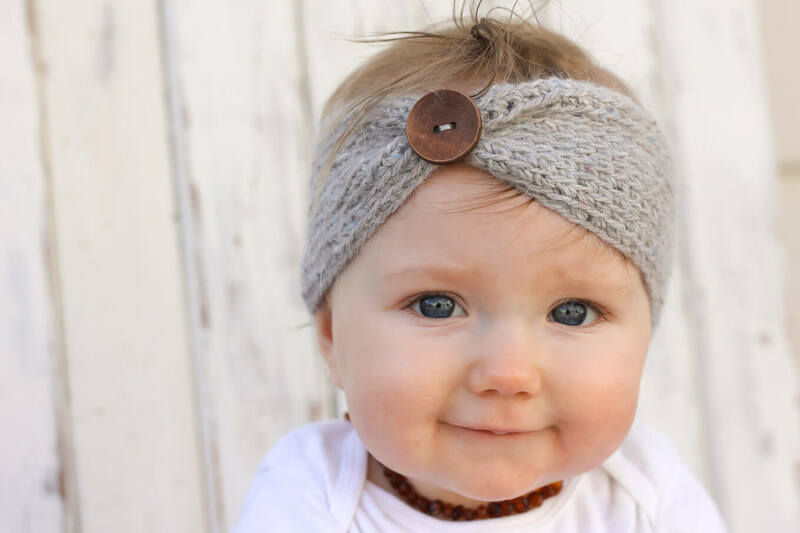 If you’re on a roll with cozy crocheting, you might like these free patterns! I am in the process of getting them uploaded to Youtube. I’d also like to offer a thought–the commercials are how you “pay” for the pattern. It took me a couple months to design this pattern, shoot and edit the videos, etc. The only way I’m able to provide this content for free is by running ads on the site. (It’s quite similar to how you watch TV for free because of the commercials.) I totally understand the desire to avoid watching ads (I often feel this way too! ), but then I’d need to be charging everyone for access to this pattern and tutorial. Thanks for your understanding and supporting Make & Do Crew! It confuses me to see that the pattern is listed as free, but the hole punching template requires $2.50. What a high price to pay for a piece of paper with dots on it. The entire free pattern is contained in the blog post and you can def feel free to just eyeball your hole placement. The $2.50 covers the cost of the ad-free, printable pattern and the hole guide is a bonus because I know many people would like a little more guidance with their hole poking. Hope that clears things up. Happy crocheting! Hi, I made the sweater boots for my daughter and now my granddaughter wants a pair. She wears a size 1, I was wondering if you came up with her size version or any ideas on how I could. Would I poke the holes farther apart if so how far apart or closers and then follow same pattern maybe using smaller hooks. I have been trying to watch the videos. However I have tried from multiple devices to watch them, but after the ad plays the screen just goes black. I watched the first 3 earlier today. Now I cannot watch any. I do not mind having the ads, but Im not able to see the content at all . Blah! Thank you so much for letting me know about the video issue. I just checked and am seeing the same problem. I’m quite frustrated and I imagine you are too. I’ve sent an urgent message to the company that hosts my videos to find out what is going on. I’m so sorry for the inconvenience! I hope to get this sorted out asap! Hmm. I sure don’t like hearing that! I’m continuing to troubleshoot with the advertising company. I actually just emailed them yesterday with more questions. I’m so sorry for the trouble. You can watch the videos here in the meantime. Well I paid for the pattern and still learning how to follow patterns so I am going back and forth to the videos to check that I’m doing it right. You can’t go back and forth, it starts over each time I try and go ahead to where I left off. Or the page reloads, very frustrating! jess, i can’t find a way to ask a question or leave a comment so trying this. sorry :(. i am wondering if i am making a larger or smaller size, how this affects the stitch numbers like when doing the toe. at times you work in a certain number of stitches and skip a certain number. do the numbers change with the size as there are less stitches in a smaller size and more in a larger size? -I found that deliberatly crocheting sort of tightly (like with amigurumi) helped me achieve a nice, tight fabric. -You might try using a smaller hook as well as adding some decreases to help the boot fit closer to your foot. I explain this in the video, but essentially, you’re adding additional decreases as soon as it seems like it’s going to be “floating” above your foot too much. Does that make sense? -Lastly, and I realize it might be too late for this pair of flip flops, I wonder if you poked your holes just slightly farther apart if that would help. You’d naturally end up with fewer stitches overall then, which could make the boot fit a bit tighter. This sounds like a great idea. If you’d like to purchase a printable copy of the pattern, you can print as many as you need and mail them to the prison. I don’t send hard copies of patterns out myself, but I would be happy to allow you to print as many as you need to share with the women. I absolutely HATE patterns that say free, and then you have to pay for them. I really wanted to make the cabin boots for my granddaughter — she asked me if I’d make them for her. Do you really expect me to sit in my office in a horrible chair to follow the pattern on my computer?!!! I’m an old lady on a fixed income, and I really can’t afford to pay $2.50 for a “free” pattern. I don’t know what you’re thinking. So utterly disappointing! I’m sorry you feel deceived, Mollie. That isn’t my intention. I make the pattern entirely free in the blog post above because I want as many people to be able to use it as possible. I simply charge for the printable PDF because I only earn money when people visit the site (and see my ads). When you’re looking at a piece of paper, I don’t earn any money and am unable to continue to create patterns or keep the site up. Thank you for your understanding. Whats utterly disappointing is ungrateful people and whats worse is ungrateful complaining people! How dare you make an untrue accusation. Thank you so much for letting me know about the video issue. I just checked and am seeing the same problem. I’m quite frustrated and I imagine you are too. I’ve sent an urgent message to the company that hosts my videos to find out what is going on. I’m so sorry for the inconvenience! I hope to get this sorted out asap! I don’t read patterns either but I do watch videos to make new things. I like just making scarves, afghans and hats. 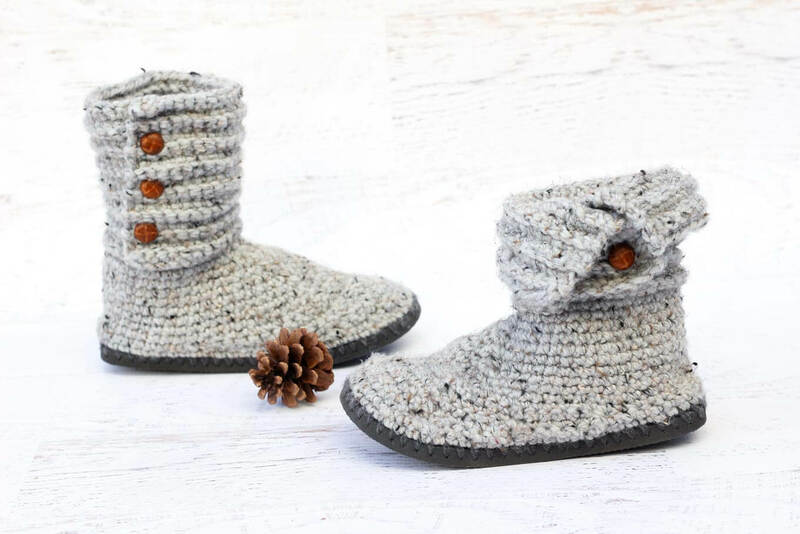 I have been asked to make these boots but I am a little afraid to get started, my sons gf showed me the crocheted shoes before so I think I’m need to learn how to do this. I started making the crochet boots from flip flops. I used a smaller size flip flop and had to use a smaller crochet hook for correct gauge, but it is turning out too large. I wear a 7 1/2 and am using the pattern for size 6. I decreased a lot more than the pattern so it would not fall off my foot, but when I got to the flap area, now I have so few stitches going around because of my decreases that my foot will not even fit through the opening. Help! Should I start over and stick to the pattern decreases? I was concerned that it was going to be so loose and flop around on my foot. I am stuck! Thanks!! I’m so sorry for the delay in responding. I was super entrenched in making the video tutorial for my new boots with flip flop soles. Did you get your boots figured out? If not, you might like to try this new pattern. I attempted to make it easier to get the snug fit you’re looking for. I hope it’s helpful to you! Do you have any suggestions on how to make this pattern for kids? I am kind of in love with the sweater boots. I was wondering, do you think it would look funky if I use a little bit of a wedge flip flop instead of just a flat flip-flop? Oh, interesting question! I can’t say that I honestly have an answer! I think if it’s a pretty minor wedge, the pattern should work just fine. If it’s more like a high heel wedge, the pattern might turn out quite a bit different just because you’d already have so much heel height from the sole. If you do give it a try, I’d love to see a pic! This may be a silly question, but do you wear socks with these booties or no? Since you said to get a size smaller flip flop I was wondering if you just put nakey feet in. This is an amazing idea! Hoping to get some done for Christmas! I just use a smaller flip flop because I’ve found that without the straps holding my foot in, there is more rubber than necessary around my toes. If you think about how you sort of need a buffer zone of rubber so that your feet don’t slide off onto the ground while wearing flip flops, you just don’t need that when you’ve made the flip flops into shoes. Hope that makes sense! I’d just measure your feet on the flip flop soles and choose a pair that’s just slightly larger than your actual foot. The website will not let me make a payment for the pattern. Any suggestions why. It just says refused. I just want the measuring tape. Oh no! That’s super annoying. I’m not sure why. Do you have Pay Pal? If you’d just like send me $2.50 directly via PayPal I could just email you the pdf. I don’t exactly why that would be happening, but I’m sorry it’s causing trouble for you! I’m with you Jessica. Would love a knit pattern…any chance? 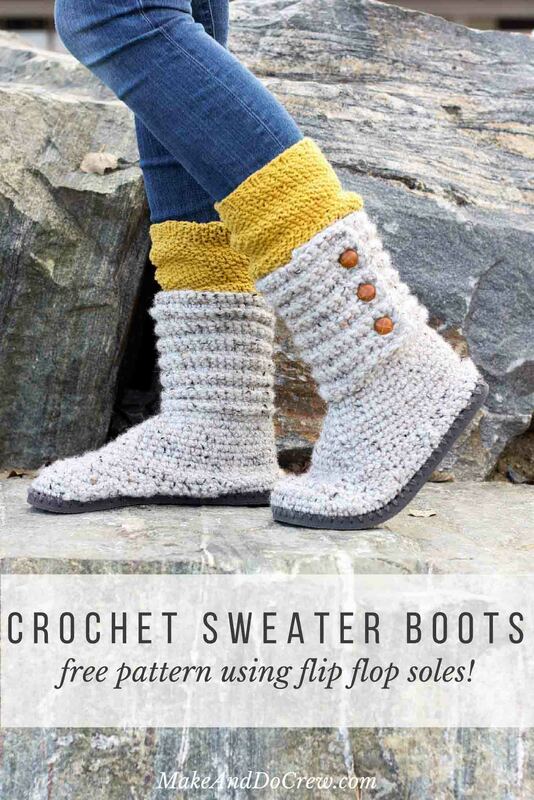 I would like to make these boots by knitting instead of crocheting. You could do the initial row of sc through the sole and then chain stitch all of them together, and then use a pair of round needles and cast on through the chain stitches, like a provisional cast on. Worth trying, anyway. Couldn’t you pick up around the flip flop using the crochet hook and then transfer onto knitting needles? Yes! I totally think you could. (And obviously this would be a lot easier if you knew both knitting and crochet.) I’m actually hoping to develop a pattern in this vein in the new year. I’ll def share it when I get it ironed out! What if you knit the top half, cast off and then whip stitched that into place? You would of course have to prep the sole slightly past the hole punching and a few stitches. Whatever you decide, Good luck! . I am going to give this a try this year. Thanks so much for the pattern Jess! ? I think this approach sounds really smart. It’s kind of what I’ve been thinking too. I’m just trying to figure out how to get the size of the knit piece to correspond with the sole really accurately. I’d love to see any of your experiments if you decide to give a knit version a try! Did you purchase the printable pattern or are you having trouble printing it from the blog post? I love these crochet boots. Can’t wait to make them 🙂 I have a question……did you make your yellow boot cuffs? If so, is there pattern for them? Thanks for the tutorial and video! Ahhh!!!! I am so excited right now!!! My boyfriend’s trailer (don’t ask) is always freezing and, let’s face it, a little dirtier on the floor than I’d like my slippers to be on haha. This is perfect!!! Thank you so much for putting in all the time and then being so willing to share it with us. You people are the ones that keep me sane in this world!! Very cute pattern and extremely creative! You’ve done a lovely job and they’re extremely cute. I would like to know how the sandal stands up to the pressure the yarn will go through each time you walk.I can envision the yarn breaking through the sandal. It’s a lot of work and it wouldn’t seem the holes are that sturdy with the pressure of walking. Any thoughts? Thanks so much! I actually get this question a lot. In my experience, it hasn’t been a problem at all. I think it’s because the tension in spread evenly between enough holes that no single hole has to handle too much tugging on it. I’ve had my original pair of slippers for about six months and they’ve held up great. Thanks for answering that question! I was gonna ask you that same thing. Seeing that it is winter here, about the only place i can get flip-flops is Hobby Lobby. In your experience, are they ok to use? I really Love this idea! Can’t wait to try it! My husband discovered your pattern & we can imagine our family out camping all wearing them. Just like Tyia our trailer gets quite dirty. Question: have you made these with the rubber top thingy’s not cut off? Oh, Vivienne, I love imagining that scene! I love camping too. I haven’t made them without the rubber straps cut off, but I know one reader left a comment that she did and it worked fine. I think you can try it out and if you’re noticing that you don’t like them as you crochet the toe section, you’ll still be able to cut them out and proceed with the pattern. I knit but not crochet. Do you have this in a knit pattern?? Love these boots!! Hmm. I’m not sure. I think you could try it and just cut them out if you find that they’re in your way as you crochet the toe. Once you get a ways into the toe section you’ll be able to try on the boot and get a good idea of if they’re annoying or not. I’d love to hear what you decide! Others might like this option as well. Have you heard of YarnSub.com? I just recently found it and it’s a great way to figure out yarn substitutions. I think you might be able to find some good info there. I love the ease of your instructions – just a note for your next video – watching you crochet with dark yarn on a dark rubber sole made it difficult to see the details. Maybe next time, let people know to choose matching yarn/flipflops, but use contrasting colors, so that the activity you are showing the video stands out & is easy to see. Thanks for sharing this project! Yes, I totally agree! It’s a hard balance between showing the process of making the actual boot and then it also being impossible to see! I think next time I’ll use a contrasting color like you suggested. $2.50 is very reasonable for the printable pattern and template. I just downloaded it so haven’t started the boots yet. I have been trying to watch the video, however, and it stops and starts constantly. I never have that problem on YouTube so I’m wondering if you know why that is happening and if there is anything I can do to fix it. I’m so sorry for the trouble. It should be working better now. There was an issue with a Chrome update and my advertising network. Please report back though if you’re having any issues. I def want you to be able to watch the videos! These are amazing!! Thank you for offering your pattern for free, you put so much time into writing it and making a video. I am going to give these a try and if I have any luck I will be back to buy the printable version. I have 3 daughters and 7 granddaughter all wanting a pair. YIKES!! I love your blog, you are super creative and talented. Keep up the great work and know that there are those of us who appreciate all you do. Aw, gosh. Thanks so much, Sue. It’s really a joy for me to share these patterns and I’m glad you will get use out of them. Your daughters and granddaughters will have some very cozy feet thanks to you! What about a knit version? You are a wonderfully thoughtful friend! I know there are a few Esty sellers who will take commissions based on my flip flop patterns. I’ll mention your request to them and they might be able to help you out! I would love to make some for her. I haven’t made them before, but I do crochet and would like to give it a shot. I may make some for myself as well lol. Sadly I just saw this sonit would be after Christmas. ? Have you thought about knitting the top separately from the flip flop and then sewing it on with needle and yarn? My mom and I have tried to crack the code on a knitted version, but haven’t exactly figured it out yet. I’d LOVE to see a photo if you try it! This seems to be a very easy pattern. I am a self taught crocheter and a knitter. I was wondering, my sister loves to go to football games. I am in the process of making her a crochet Bengals blanket for her to keep warm. She found this pattern and asked me to make her some. Instead of using one color do you think its possible to use maybe two colors? Like get a black flip flop and use black wool for the foot, a orange at the beginning of the ankle and black at the top. so she could wear them with her blanket when she goes to the Bengals game? just thought to make them more personal for her that it would be a nice gift to go along with her blanket. Have you tried using two different colors or do you think it would look to busy? What an awesome gift! I would love to receive a football afghan (in Broncos colors for me! 😉 I think you could totally use two colors for the boots. Maybe one color for the bottom half and then another for the section called “ankle”. Also, it might be cute to use orange flip flops and then entirely black yarn for the boot. It could be Bengals inspired, but not run the risk of being too busy? I’d love to see a pic of whatever you try if you’d like to share one! Hi Jess. I did make this in two colors. I have a lavender flip flop and used purple veriegated yarn for the foot and gray for the boot. Funny thing is I somehow got turned around on the boot and my flap is backwards. It’s OK though they are still neat looking. Just a tad different with the colors. I will find someone to love them if not me! How do I send a pic of these to you? Oh I found really sturdy flip flops at Hobby Lobby for $1.99. I bought several. I have already made several of the flip flop shoes. I also use a hole punch tool to make the holes. The one I have makes several sizes and I use the smallest. Works great. Thanks for your site and your pattern ideas. Thanks for the tip about Hobby Lobby! It’s great to know where to buy flip flops this time of year. I’d love to see a pic of your “backwards” flaps. You could email it to me at jess (at) makeanddocrew (dot) com or tag me on Instagram (@makeanddocrew). Thank you, these are great! Where do you find the 110 yards per skein of the Wool Ease Thick and Quick called for in the pattern? It’s just that I’ve only been able to find that in 106 yards per skein. Really cute idea. Thanks for sharing. You’re welcome, Christie! I hope you enjoy the pattern! Jess, can I substitute cascade eco wool bulky worsted for the Lion thick and quick? As long as the yarn you find has the same weight as the Lion Brand Thick and Quick, I’d just check the label specs for Thick and Quick versus the Cascade Eco Wool to make sure the label’s recommended hook size and gauge are similar. That’s usually how I estimate if I can easily swap out yarns. Good luck! I’d love to see a photo when you finish if you’d like to share one. I love these!! I can’t wait to make them for my girls and I. Quick question….are the flip flops you bought grey or black? Also just an FYI Target online has their flip flops on clearance right now for $2.38. Wow! That’s an awesome deal at Target. I just found some at Old Navy on Black Friday for $2 as well. I’m glad we can still get flip flips in the winter! These look really fun! I’m a knitter, but know a little about crochet… and now want to try these! Thank you for sharing your creative ideas! I was wondering if when you start each new row is the first single crochet in the slip stitch of the last row? I have been trying this for the last few days and its just not turning out. Which section of the boot are you talking about? I’m not exactly sure where the slip stitches are that you’re referencing. Let me know and I’d be happy to help you out! I am wondering the thing. It’s in the back of the boot . After the hdc, DC and slip such the row together. The next rows call for the SS and chain one and then sc. Is the SC supposed to go in the SS or the next space? Either way I do it, the back looks a little funny. I’m wondering which row you’re referring to when you say, “The next rows call for the SS and chain one and then sc.” I’m a little confused. Hope that is helpful. Let me know if you need more clarification. And I will say, my boots have a small imperfection in that spot just because of how they have to be joined in the back. It’s not noticeable once you crochet a few more rounds, but it may just not be quite as smooth as we’d wish because there is a half more round on one side of the boot than the other. Hi, these are so cute! I’m so excited to make a pair or two! I know that you’ve spent a lot of time working on the logistics of the pattern. I noticed in the pictures that there’s a bit of excess fabric on the sides of each foot closest to the flip flop. Would it be possible to increase the distance between the holes to have them fitted more closely to my foot? That’s a great question. I think that extra fabric is partly due to just the natural slouching that happens because the fabric isn’t entirely stiff. I think that to avoid it, you might want to try doing more decreases overall so that it fits even closer to your foot. So, either start the decreases on the toe earlier or maybe once you do start decreasing, do an additional decrease on either side, more toward your arch and outer foot for a few rows (in addition to the other decs the pattern calls for) in order to just tighten up that section. I’d love to know what you come up with and if it works out! Hi Jess! My daughter loves these and I’m in the process of making them for her. I bought the pattern, and you’re right, it’s so easy to follow. I watched the videos a couple of days ago to get the gist of it but now I can get the videos to play, just the ad at the beginning. Do you have any idea why? Thanks for your purchase, Heidi! In the mean time, I’d suggest starting the single crochet decreases a little earlier in the pattern so that the boot hugs your foot better. You might also try a slightly smaller hook if you have one. Your website is very slow and the last video was not coming up on at all. Very slow and can’t load up the video and then play it completely all at once. Very frustrating. I also had problems trying to buy your pattern and each field wouldn’t let me finish typing in my need info. Tried to type passwords and it wouldn’t go to the next field. ????????? I’m sorry you had trouble purchasing the pattern. Did it end up working out? Those fields you’re mentioning are not actually on my site, they’re on LoveCrochet.com, which is what I use to sell my patterns. I will look into if other people are having that issue. As for the last video, I will check into what might be happening there. I definitely want you to be able to load all the videos! Bought, downloaded and printed 🙂 Wish me luck. I am NOT good at following patterns because I tend to be a visual learner but since you have the videos I went for it. Thanks so much Jess!! Love this! I think I have followed the pattern but my boot is much bulkier at the toe region, definitely not curving nicely like yours. I used the guide to make the holes. When you Any suggestions? I’ve already started over once and I really want this to work! Perhaps I could send you a picture of my boot? Hi again! So I am guessing you will suggest adding decreases. Can I add these in the middle of a row? It seems like I have gaps when I transition from a decrease to starting SC in the row below. Not sure if that makes sense. Thanks for your help! Sure, you could def send me a pic of your boot. That would be really helpful in “diagnosing” the issue. I know what you mean about the transition onto the sole after the decrease. I had to work those really carefully and a bit tighter than the other stitches. Have you watched the videos? I mention this a bit in the videos–I think it’s in the Part 2. Also, in the videos I talk about how to make it fit a bit tighter to your foot if necessary. I think you have the right idea by adding more decreases. If you feel like you need to start decreasing asap (because the toe is just immediatly too high up), I’d do a dec in the middle of each row or every other while for a little while as you work the toe. If it’s looking too loose as you further back in the toe section, then I’d add some extra decreases near your arch and the corresponding outside of your foot while you’re working the other decreases on the top section of the toe. Thanks so much, Jess! The boot I emailed about yesterday is long gone. Decided to rip it out and start over. I have watched the videos and am going to be more mindful as I go, tightening it up, here and there as needed. I had wanted to make 5 pairs before Christmas. For now, I would be happy with 1 good boot! Appreciate the feedback and will keep tweaking it. Great pattern, videos, etc. Well done! Haha, I’m glad you didn’t wait for me to just take some action! I think once you figure out the tightness and customizations that work for you, you’ll be able to crank these out. It’s all sort of a big experiment 🙂 Just be sure to keep notes as you go if you change up the pattern so you can repeat them on the other boot. (I learned this the hard way, lol!) It might also be useful to size down a hook size if you’re finding them looser than you like. Good luck! Send me a pic when you finish if you’d like! I wear a size 6 shoe and the flip flop I am using is a 5/6. I tried making these 2 times so far and they keep coming out way too big. The second time I used an I hook but the front of the boot was still so giant. I have a total of 62 on my foundation row. Any suggestions on how to make it fit? They don’t look as nice as yours and I don’t know what I am doing wrong. I’m curious if you used the little printable ruler in the pattern pdf? If not, I’m wondering if maybe your holes are a little too close together. For reference, mine are a size 8 flip flop and I poked 64 holes. If you don’t feel like you can repoke the holes, I would just do some decreases evenly around that first row as you crochet onto the sole. If you need to do more decreases as you’re working the toe section, I’d try adding them around your arch and the corresponding outside area of your foot to make the boot fit closer to the top of your foot. I hope that is helpful! These are def not an exact science, so keep experimenting! The shoe is a size 6 how many holes would you suggest? I am going to be buying the pattern tonight and using a size 8 shoe and trying it again. If you’re buying the pattern, I’d just print the “ruler” on the last page of the pattern and use that to guide your hole poking. Then, whatever size flip flops you use, you’ll have the holes spaced at an appropriate distance to achieve the gauge. I love these boots! Mine have turned out way too bulky. If I start over and add some decreases, can I do that in the middle of rows? When I transition from the decreases to the adding SC on the row below. I have a gap or space in the boot, where it’s extra bulky. Is that normal? Just want to make sure I’m doing it right. Thank you! Love these boots. I adjusted the pattern to make them for a toddler. They turned out super cute! Thank you fo sharing! Leslie–I’d love to see a pic if you’d like to share! I bet they’re adorable! I’m trying to make smaller boots 6/7. After the first 9 rows it goes to making size 8 and larger but what do you do if you are not making 8 or larger? I can’t skip to row 19 or there is not enough material on the bottom? So the intention there is that if you’re a size 6/7, you just move onto the next section. So yes, move on to row 19. I’m not exactly sure what you mean by “not enough material on the bottom.” Do you want to explain that a little more? If you stop at row 9 then pick up at 19 where the ‘flap’and buttons start, that part is right on the heel since there is only 2/3 rows on the heel…….there is no building up to that part. Does that make sense? It makes them really short ankle boots. Anyway, I am tweaking it so that 8 get the height needed for me. Thanks! I love your patterns. I have a list of people waiting for slippers and now a few wanting boots! I hope I get the boots made before the end of winter! Yes, I totally see what you mean. That’s a great point. Will you mind sharing the details of how you tweaked yours in case it’s helpful for others? I’d really appreciate it! Hi Jess, I love these boots! I have watched the video and I’m going to download the printable instructions. Meanwhile, I just got some high grade Sanuk flip-flops from my local bike shop – at a tremendous markdown! They are men’s size, so a little wider than normal – but I do have a wide foot. They are actually comfortable for me, and I can’t wear standard dollar-store flip-flops. The flip-flop straps are inset on sides about 1/4 inch; and the straps are nylon with a soft knit inside. … my question … is it OK to leave the really nice straps on the flipflop, and work the punch holes alongside them? I think the foot straps would help stabilize my feet inside the boots once they are knit. I think I could poke holes all the way along the sides. The strap between the toes is of a soft knit fabric, again, more comfortable than the standard plastic thong-thingy. These are the first comfy flip-flops I’ve found, so I hope they’ll work for boots! Wow, awesome find, Helen! I think you could def try leaving the straps on. One reader mentioned that she was able to leave the straps on inside the boot with no issues. If you get going and decide you don’t like having them in there, you can cut them out before you start the ankle section. Have fun! Thank you, Jess. Another question … have you ever tied felting these or any of the flip flop patterns? i am excited to try to make these!!!! you’re video makes them seem fairly simple. you do a great job explaining and demonstrating 🙂 my biggest concern at this time is getting the hole angled consistently. would it work to copy the hole pattern and take 2 together and fold one half over the top and poke into a dot on the side thru a dot on the top? thought i would practice on some old flip flops to try and get it right. I think if you practice on a scrap pair of flip flops, you’ll get the hang of it before you try your “real” flip flops. It’s not imperative that the angle is exactly the same on each hole as long as you make sure your poker comes out far enough away from the edge of the flip flop that your yarn won’t tear through. 1/4″ is about good. Have fun and keep experimenting! 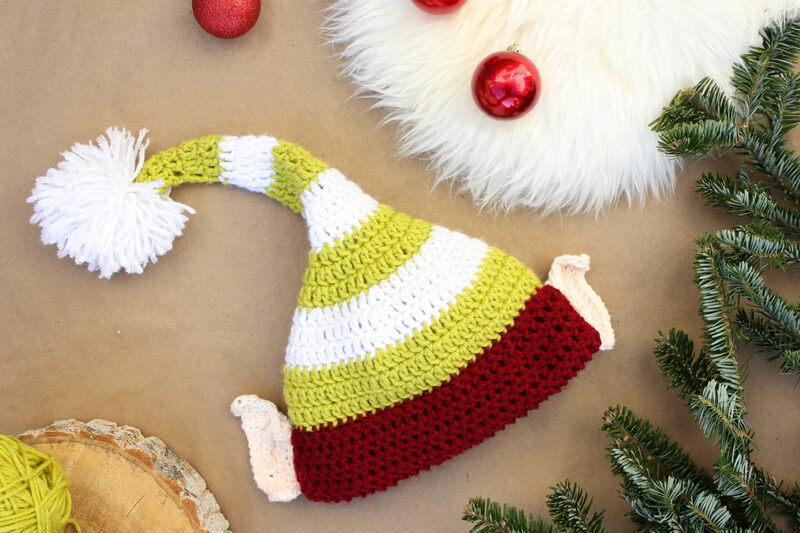 If you had to rate this crochet pattern on a scale of 1-10, where would you put it? I’m just starting out crocheting and fear it will be too hard. 4-5 at most. Following the video is very easy! It’s been ages since I’ve crocheted anything more complicated than a scarf or baby blanket. I saw your boots on my Facebook page and I KNEW I had to try them. I purchased the pattern to be sure that I would space the holes properly. The modest price was worth every penny because I felt confident with knowing I had the soles properly spaced. Your videos are a great complement to the printed pattern. I’m one of those folks who do well with visual cues. One thing I’m wondering about: I am left handed which is why I rarely try to follow a pattern. Most of the time I get so confused because I have to reverse the directions, etc. It really does help to have the visuals. Anyway, I watch your video and follow the instructions and I find that I am ending up working the stitches from the interior of the shoe instead of from the outside of the shoe. That has made it a bit more difficult to create a smooth, non-bulky toe especially. I don’t mind ripping the stitches out and starting over because the yarn is thick and goes quickly. Do you think that it is looking less “finished” because I am working from the interior rather than the outside? Thanks again for such great instructions. I do think that working them from the inside will make a difference in how the “fabric” looks. If you start over, I think you should be able to work on the outside of the sole by simply joining the yarn and then heading left. This will mean that the video will look sort of backwards to you, but I’m wondering if you will still be able to follow it since now you’ve practiced the basic techniques. Hello. Do you start your crocheting in the same stitch as the chain one or do you go into the next? Thanks! Wouldn’t these be extremely slippery? Unless they’ve changed the treads and material in flip flops to be worn in sno and icy conditions I’m not sure these would be safe to wear out doors. Hello, I would like to see if I can send you some pictures of what I have done so far. I have just the right foot and so far it looks very odd. Please help if you’re able. It looks similar to your pictures but it doesn’t look normal like yours do. I am attempting to make these slippers, I used the provided grid for the holes but there are far to many stitches, the boots will not fit my foot, I continue to reduce and hopefully I can figure how to make this pattern work. I am disappointed that I bought all the supplies and am having such a difficult time making this slipper, I have used a smaller crochet hook and they are still too large. Have you adapted the pattern at all? I’m sorry you’re having trouble. I think you’re taking all the right trouble shooting steps. I haven’t adapted the pattern at all, but there is def room for variation as these are quite specific to a crocheter’s specific looseness or tightness of stitching, foot shape and size, etc. I think you have the right idea by decreasing early on to get rid of some of the extra stitches and bulk. Are your flip flops one size smaller than you usually wear? can these be made acrylic or polyester blend yarns rather than the wool? i had a difficult time finding any yarn i liked that wasn’t poly or acrylic. I’m so happy to hear the videos have been helping you, Summer! It should be the same stitch you joined in. Sorry that’s not clear. So you sl st, ch 1 and then work the first sc into that first st that you sl st into. Essentially, the first sc of each round should be in the same spot and you should be able to maintain the same number of stitches per round. Thanks for sharing this pattern! My mother has terrible foot pain that is exacerbated when wearing shoes. So she wears flip flops YEAR ROUND. In Utah. I am making a pair of these bootsnd have a question on rounds 11-17. Instructions say to sl st and then ch 1 for the next round. But I don’t notice that you do that in your video tutorial. I also wonder that if I follow those exact instructions, do I sl st then ch 1 and sc in the sl st or in the next sc from former round? I hope these keep your mom’s toes cozy! I think I did do the sl st, etc in the video, but I might have edited that out (or done it slightly differently)… Either way, you can sl st, ch 1 and then work the first sc into that first st that you sl st into. So essentially, the first sc of each round should be in the same spot and you should be able to maintain the same number of stitches per round. Hi, Jess. I just want to say that these are wonderful and they don’t really seem too awful hard to make. My situation is that my boyfriend saw these, not sure if it were these particular ones or not but he asked me if I could do this. I told him I would try. My issue is, his right foot is partially amputated. He is a 25 year war vet and it’s so hard for him to find good shoes, especially slippers, that would fit his prosthetic piece. So I thought, if I could make him a pair of slippers like this, without him having to use the prosthetic, he wouldn’t need to wear his shoes around the house. Any ideas? What a wonderful idea, Tammy! I know several people have customized my flip flop patterns to accomadate less typical situations with their feet. What is his prosthetic piece like? If you’d like to maybe email me a pic of it, I could help you brainstorm how to adjust the pattern to fit him. My email address is jess (at) makeanddocrew (dot) com. You’re right in assuming it would be too thin. You might be able to use 2-3 strands of worsted weight held together, but I am not sure about the gauge since I haven’t tried it. Wow! ❤ Thanks for your very good explanation! Any luck fixing the video yet? I’m having a difficult time even getting to the video as the page keeps jumping around. I bought the pattern but wanted to wanted to watch the video the first time through. I actually had a hard time even typing this comment as the page kept jumping back to the top. Booo! Really? I’ve been trouble shooting this and haven’t had this issue anymore. I’m so sorry. That sounds really annoying. If you wood, can you please let me know what browser you’re using and if you’re on a Mac or PC? I’d like to send that info to the people who host my videos because they keep assuring me the problem is solved. I’m really sorry for the inconvenience! I am having problems too. I have tried PC with Windows 7, Android phone, Kindle HD, and my son’s ipad. The videos don’t load completely. I will have a black screen with your voice. I can not go forward in the video and sometimes mid instruction a commercial will start. I purchased the pattern and after trying it myself, decided I really needed the videos.. Even typing this, I have an ad over my comments so I can’t see if it is right! I will email you my screenshot. I don’t mind ads on the videos, because that’s how you get paid for the awesome work you do. Youtube also offers ads for payment. Thanks for your feedback. For some reason, a few readers seem to continue to have trouble viewing the videos. I have send your feedback to the video player company. I’m so sorry for the annoyance! I did just get the videos up on Youtube and you can find the first one here. Unfortunately, Youtube’s ads pay only pennies, so it’s not a very viable way to support the site. (I think I’ve made $20 on there in the last 6 months!) Most of all though, I want you to be able to actually MAKE my projects and WATCH the videos and I’m happy for you to do it on Youtube if that’s what works on your computer! I live in Australia and am wondering if you can advise what ply the wool is that you recommend for these slippers? I will have to find a substitute and I hope it works out ok! I’m going to have a go at making a pair for my sister for Christmas ready for next Winter! I’ve got 9 days……. so I’d better get cracking!!!! I look forward to hearing from you Jess! Have you heard of YarnSub.com? It’s an awesome resource for finding substitute yarns that match the gauge of the yarn a pattern calls for. So I’m at the end of row 3 and have been trying to sc2tog in a way that looks nice and neat. Every time I’m left with a hole because of the big jump from row 3 to the foundation round. Would it totally mess up the toe if I added a stitch to the side before doing the sc2tog? Hope that makes sense. Or any tips on making the sc2tog more cohesive? I’m making the pattern in women’s 7 (so size 6 flip flop). I completed row 10 of SC and proceeded to row 11 and up to decrease. It just seems like the boot is way too large. Should I have skipped Row 10 SC? I have made these 2 times and I’m having trouble with them being very large around the foot. The only difference is I used big twist super bulky yarn instead of the thick and quick. I am not sure what I’m doing wrong! Any advice? They are so cute but my foot slides all around inside due to the largeness of the foot part. – That yarn might be slightly heavier. I’m not sure because I haven’t used it. Perhaps sizing down your hook could help. – Have you watched the part of the video where I talk about troubleshooting if your boots are too loose? That might be helpful. Essentially, I recommend adding more decreases so that you reduce the total number of stitches, thereby making the boot fit closer to your foot. – When I crochet these, I keep my stitches pretty tight. You might want to just keep a mind toward crocheting tightly if you’re able to. These flip flop patterns def require a bit of experimentation. I’m happy to keep brainstorming solutions with you so that you can make something you’re happy with! How long do these take to make if one is a beginner ? I am wanting my craft group of ladies to do these when we meet. I’d guess about 3-4 hours per boot for someone who has a little bit of experience crocheting. These look awesome! Roughly how long would you guess these would take a beginner to work up? How many hours? Hmm…I’d estimate about 3-4 hours a boot for someone who has done a bit of crocheting before. I’d guess they take me about 2-2.5 hours per boot. I’m not an expert by any means, but I have had a lot of crochet practice! Hi! I think you did an amazing job on the video and written pattern for these boots!!! I appreciate the time and energy you put into doing this! I just love them and can’t wait to make a pair!!! Thanks so much!!! Thank you so much, Jennifer! It brings me so much joy when my tutorials are useful to my fellow makers! I was wondering if you could please put closed caption of what you are saying, for those of us that are hearing impaired. Thanks for your feedback. I can see how that could be really valuable. I’m a one woman operation so I don’t always get to all the details of making the videos super usable for everyone (lefties, hearing impaired, non-English speakers). Do you know if there is a service or computer program that helps close caption things? I wonder if there’s a way to do it besides transcribing the entire video myself. I will def keep your feedback in mind! I am working these up for a male using size 10 flip flops. The cavity for the foot is massive, and where the rnd 11-17 decreases are is bulging. Do you think I should maybe go down a yarn guage? I am using Lions Brand Heartland Thick and Quick which I thought looked like a similar enough substitute if a little smaller perhaps, but the shape of the boot is not working at all. I imagine that since the flip flop is quite large, you’re just ending up with more total stitches than you need. (Since there are more holes on the sole, so there are more stitches being created for the entire boot.) I do think you could try a smaller hook, but also, you could start decreasing on the toe sooner so that it lies flatter against the foot. Does that make sense? Overall, you’d just be reducing the number of stitches so that the toe section isn’t such a large cavity. I explain about this a bit in the video. Hi, I was wondering if these would work with any other yarn besides wool? I would love to make them, but my son has a wool allergy so I won’t use wool. (We found out about his allergy from a wool scarf I had, I had it for a year when he put in on for 30 seconds, which ended up with him in the er.) I’m somewhat new to crocheting, so I’m not sure if I’d be able to use something besides wool or how I’d have to adjust the pattern if I did. Oh my goodness–that sounds scary! Have you heard of the site yarnsub.com? It’s great for finding substitute yarns that have the same weight as the yarn a pattern calls for. I bet you could find a great option there. I’ll check it out, thankyou! I’ve just started to crochet so I’m still trying to figure everything out. So if I can find something in the same weight, then the pattern and everything would still be the same, right? I just purchased the pattern and the yarn. Just to make sure I understand correctly before I get started, if I generally get 7/8 flip flops, I need to be using 5/6s for the sole, correct? Ha–I’m glad to get that feedback. It’s hard to make everyone happy, so I just try to offer different options for people. Yes–you’d want a slightly smaller flip flop than you usually wear. Basically, you just want a little space around your toes and heel instead of the usual amount of extra rubber. Thank you for this wonderful pattern. I have made 2 pairs of flip flop shoes and one pair of boots that I designed from looking at other flip flop shoes on the internet. I think this will be my favorite pair when I get them done. I wear a size 6 flip flop for these shoes and hope I can get the pattern to work for me in that size. Many thanks. I’d love to hear your feedback. I think the pattern is working better for sizes 7 and up. I’m actually starting a pair of size 6 boots this weekend so I can figure out if the pattern needs to be tweaked at all. Feel free to let me know what works for you! I am just about finished with the second shoe on size 6 flip flops and the fit is perfect with no changes in the pattern. I have seen several people on here wanting to make size 6 and if you would like to inform them how to do it I poked 60 holes in the flip flop at 1 cm apart.Again thank you for the pattern, I just love them. Just to add I had to use a 5.5 mm hook and crochet tight to get the right gauge and instead of the 8 mm for the top part I used a K 6.5 mm and crocheted not so tight. The size 6 boot worked out great and since then I made a size 5 for my niece. She says they fit perfectly and wears them to school, she teaches in Iowa. I am making a pair similar to these and was looking at your videos for help but they do not seem to be working. Hello, I love your pattern and your printable instructions and videos are very straight forward. Thank you!! I completed both boots after following all the instructions. One issue I”m having is that there are small holes (you can easily poke your second finger in) where we sctog after rows 7-10. These holes are in the same places for bothe feet.. any suggestions to make the holes less noticeable or fill them in without starting over? Hmm. Do you want to send me a pic so we can brainstorm some solutions? My email address is Jess (at) makeanddocrew (dot) com. I have purchased the pattern and I am wanting to make the boots. I am concerned that after you wear the boots, the thread will pull out of the flip flop. Is there anything I can do to make sure the thread will not tear the flip flop? Thanks for your purchase! I’ve worn mine daily for about 4 months with no issues at all. The tension is spread between enough holes that no one hole has too much pressure on it. Just be careful punching the holes and getting the yarn through them and you should be good! I’ve been itching to make these, I just haven’t found myself some flip flops. That said, I did just receive some amazon gift cards 😀 Mean while, my 7 year old bought me bernat blanket yarn for Christmas, and not in my favorite color. You know how children are, they pick colors they love for us haha. I’d love to make matching boots for us! Is there any chance you’ll make a child size version? (he’s in a big kid 12–is it big kid? hmm…just think 1st grader lol). I plan to purchase the pattern, because I NEED the ruler. Just wondering if it would be simple to convert it to child size also. Kids are def funny like that. My husband let my daughter choose underwear for me one time (she was 2) and it was atrocious! So funny. I was wondering how you might recommend doing a smaller size than a 7-8 i have a coworker who wears a size 5 shoe but wants me to make her some. I would love to hear your thoughts and ideas about how to do smaller boots. 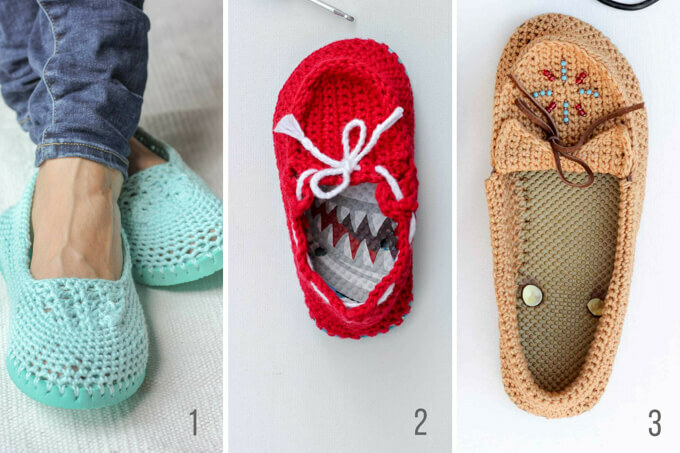 I was thinking about trying your boat shoe/slipper pattern and just adding an ankle or using a smaller gauge yarn but if you have better ideas i would love to hear them. Thank you! I think you can totally make a smaller size. I’d make sure you’re using a tight gauge when you make them and just follow the instructions for the smallest size. Once you’ve gotten a good portion of the toe section created, you can decide when you want to stop making that part and move onto the ankle. If you scroll up in the comments, one reader shared some notes on how she made a smaller size. You might have to add a few rows toward the back of the heel to build it up before starting the ankle section. Hi! I’m makin these for a friend and I’m super excited she sent me the link to them! Anyshwayz, do you have an Instagram account? I post pics of things I make on IG and I would really like to tag you in the post especially since I make money crocheting things for people. I want to give credit where it’s deserved! Heck yes! I’d love to be Instagram friends. I’m @makeanddocrew. Come say hi! I need help getting the commercial free video to load. I bought the pattern but the link will not open the video. Ive tried settings etc and no luck. Ideas? I’m so sorry you’re having trouble. I’m looking into it. In the meantime, please watch the videos here. HI! This is such a genius idea! I was wondering whether the crochet part keeps your foot in place. I have seen knitted ugg type boots and all have a leather part on the heel in order to keep the foot from sliding off the sole and that got me a little worried since I am planning on adding insoles and wearing them outside. Thanks a lot! I always use insoles inside my crochet flip flop shoes for more comfort on my soles and their is no problem with it. I just want to thank you for this pattern, and for posting the video to go with it. I bought the pattern, just to get the hole template, but I am a visual learner. I was having trouble even getting started, so watched the video, and everything was made clear for me. I am making the first pair for me (so I can work it out) then my daughter and her family all want pairs. With the videos, I am finding everything pretty simple, and I am a fairly new crocheter. I made two pairs… Already shared your link… ???? going through a breakup and crotchet is very therapeutical for me. And these boots are exactly what i needed. I ripped them apart so many times but i still made it. Thank you so much… Now i wanna try the mocassins Oh and am from Kenya… Your creativity is spreading???? Not sure if this is a silly question or not. For making smaller or larger sized boots, do we need a total of 64 holes no matter the size. Or is the the number of hole change depending on the size of the boot? You do beautiful work. I love the ideas to take advantage of flip flops. Although I can follow a pattern, I really have no idea how to adapt a pattern. Many diabetic or older individuals suffer from edema. If you CAN find something to fit, it is extremely expensive and doesn’t take your color and style preferences into account. 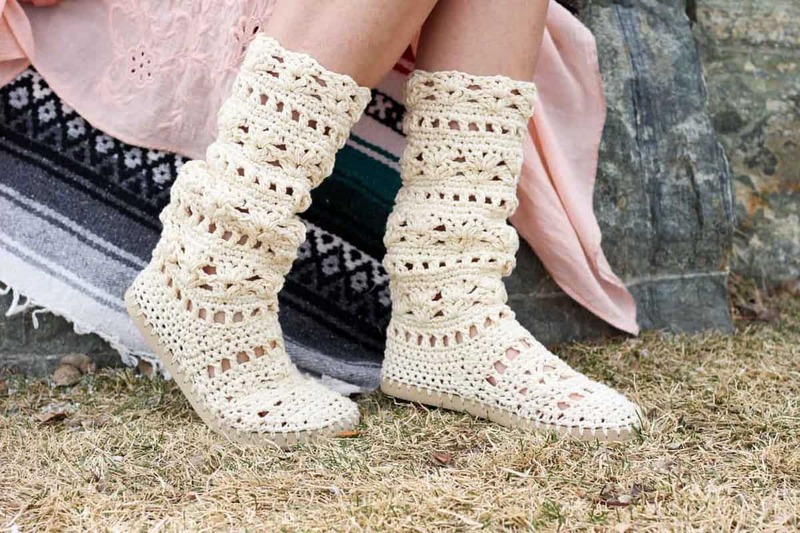 Would you be able to create a tutorial to adapt the crochet sweater boots? My chubby ankles would warmly thank you! Hey, so I love this pattern. These boots are super adorable and I am currently trying to make a pair. I seem to be having trouble though with the decreases. I end up getting these really large holes when I move from a row to do the sc2tog into the foundation round. I do amigurumi and I have had the same problem with decreases in that as well and I usually end up sewing in extra yarn at the end to fill in the holes. I naturally crochet tight, so I don’t think loose stitches are the problem. I keep trying to rework those stitches but seem end up with the same result. Are there any techniques I should try that might fix this problem? Any suggestions would be great. Thanks again for coming up with such an awesome design! I know exactly what you’re talking about because those decreases can be kind of finicky. Have you watched the videos by any chance? I show what I do to minimize the appearance of the decreases. In short though, I try to make each progressive loop on my hook during a decrease a little tighter. So the first loop on my hook is the loosest and the second one is a little shorter and the third and final loop than ends up on my hook is quite short. By doing so, the first loop can sort of overlap the second two and smoosh them together a bit. I hope that is helpful! 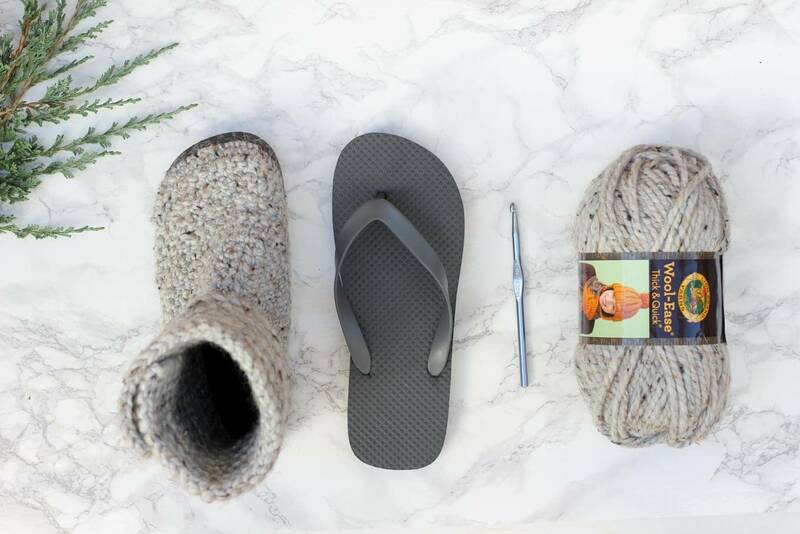 Jess, would you give us some suggestions for yarn to use for the flip flop slippers and boots? I knit a pair of slippers with Lion Brand Wool-Ease and discovered that it pills horribly. I’m thinking maybe a washable wool and nylon blend. What do you think? That’s a bummer! What color did you use? My boots have held up surprisingly well with very minimal pilling. I wonder if different colorways pill differently? Anyhow, YarnSub.com is a great resource for finding substitute yarns if you’re looking for something with a similar weight, etc. for a pattern. I think a washable wool and nylon blend sounds awesome. Is there a brand you’re thinking of? I’m intrigued. I love the fact that FREE is NOT FREE. Just to get a copy of the pattern you MUST PAY; that is WHAT the advertisements are for, to pay for it. Just to get this pattern I ran out of paper because 81 pages HAD to print. I’m sorry you used up so much paper in an attempt to print the pattern. That sounds irritating. The free version is available in it’s entirety in the blog post above. The site takes close to $1000 a month to run, and that includes no “salary” for myself. The ads help allow me to create free content, sort of like a commercial brings you a TV show for free. I do understand that many people like to print patterns though, which is why I offer the inexpensive PDF download option. I made a pair of these for my granddaugher who is 16 and tagged me in a post on FB. I bought the pattern for the holes as I thought $2.50 was “cheap” and I felt I needed it. However after starting it and using the pattern without watching the videos, I struggled and decided to resort to the videos – anyway once I figured it out, it took little time to do the pair of them. My question is I now want to do a pair for my granddaughters that are 5 & 7 so I have found some flip flops (very hard to find in the great north in the winter anywhere except online) – do I need to adjust anything to do this in a smaller size – I know there will be less stitches – my grandchildren live in Florida, so I can’t just put it to their foot to see how it is fitting. Any suggestions? I’m glad you found the videos helpful. I worked really hard on them because I do think this is the type of pattern that benefits from some more detailed explanation. I’m actually releasing a boot pattern in the next few weeks that might be a really good option for “downsizing.” If you don’t want to wait for that though, I would just experiment with using the same technique, but ending the toe section and beginning to build up the back of the heel a lot sooner. I think that since you’ve made a larger pair, you will be able to test out the same concepts just with fewer stitches. Great to read that you are releasing another boot pattern. I’m wanting to make some for my daughters who are 10 and 8 but I wouldn’t know where to begin to ‘tweak’ your adult pattern so that they will fit my girls. I’m guessing just using a smaller hook won’t work? The yarn I have to use is 8 ply. Will look forward to seeing your new boot pattern and keep my fingers crossed that you have kids sizes in it. I have a hard time with the left boot. It is not coming out right. Very frustrating. Can you also do the left boot. Help!!!!!!!!!!!!!!!!!!!!!!!!!!!!!!!! Hi Jess! Is the hole gauge the same for your other patterns using flip flops? I want to be able to print and keep the gauge if it is. I’m about to make these for a friend. I’m a little nervous that I’ll be able to do it but it’s always worth a shot. When I’m done with hers I want to make some for me. lol Thanks! These boots require holes that are spaced out further because the yarn we use is thicker. I am releasing a free boot pattern in a few weeks though with the same gauge so you could def reuse the guide for that. Woohoo! You can find the new Breckenridge Boots pattern here! Can you give me a real measurement for the holes 1/3 inch is not a measurement. Do you mean 3/8ths? I mean .33 inches, which yes, is around 3/8ths. The ruler in the printable pattern is very helpful because it allows you to poke the holes exactly an equal distance apart. If you’re not using the ruler though, do you best to make the holes about 3/8th of an inch apart. Do you do something to the sole to protect the yarn from being worn through when wearing them? I would think within a short time you’d wear through the yarn ruining the boots. Actually, the yarn doesn’t touch the floor/ground the way I make them, so it doesn’t get worn through easily. I’ve worn these boots as slippers every day for about 6 months and they’re holding up really well. I have frogged these three times, went down a hook size, and crocheted as tightly as possible (even added in a few extra decreases) but they are still so lumpy and huge! Do you think the pattern would work well with a worsted weight yarn instead of the bulky? I imagine a worsted weight yarn would probably result in some pretty mesh-like boots. You might like to try out my new Breckenridge boot pattern using flip flops though because I think it’s the easiest one yet to achieve consistent results. You should be able to use the same holes you poked for the Cabin Boots as well as the same yarn. I am thinking about trying this with wedge heel flip flops, any suggestions for things to watch out for? G’day Jess, just love these boots but unfortunately can’t knit or crochet. If ever you get a kit together I would be interested to purchase. I love that music you use in your ad as well. Could you please tell me the artist & track name. G’day Jess, love the boots, just can’t crochet. Love the tune on your video, could you please advise me the name and artist. It is a bright little diddy isn’t it? 🙂 The song is called “Happy Mandolin.” You can find more details on it here. Loved this pattern, and was excited to get stared. I paid my $2.50 and down loaded the pattern, to my surprise it was all jumbled up and unreadable., so I was very disappointed that I wouldn’t be able to use the pattern! Oh no! That is so strange. I really don’t know why that would be the case. Either way, I’ll send you the pdf right now to the email address associated with this comment. Please let me know if you don’t receive it. Thanks for your purchase, Karen! I have purchased the directions but still get ads with the videos. How do I access the ad free videos? Thanks for purchasing the PDF. There is currently no option to watch the videos ad-free. Running ads on the videos is the only way at the moment that I can cover the costs of my time to create them (it takes 40-60 hours to film and edit a tutorial like this). I run ads on them so that more people are able to use and benefit from them for free. Thanks for being here and for your understanding. I just finished the right foot and changed it up a bit to fit my personal tastes. I added Concho instead of buttons and again posted to my blog, so go have a look see if you have time and Thanks again for such a great and fun pattern! The size of flip flop is misleading (not even sure you are aware), but it will throw and frustrate some. The ones I found had 7/8 marked on them. I attempted these and came up with 56 holes. Then going back to the store, I discovered that size 8 flip flop are also marked s 7/8. This time my holes were the correct amount. So size 7 and size 8 flip flops can both show 7/8 on them. Well, at Old Navy anyway! Yes, I’ve noticed this with my Old Navy flip flops too. I’ve noticed that the tags on the flip flops (or on the plastic hanger) say a specific size though (like 7) and those are a slightly different length from, say, a size 8. So I’ve found that it’s most helpful at Old Navy to look at the actual tag and not the number on the bottom of the shoe. It IS really kind of silly! I’m glad you found a solution that worked for you! hello, about a month ago i purchased your pdf pattern, but after printing it out i thought i saved it, but can’t seem to find it anywhere. is it possible to get it again without paying for it? I’m so happy your persevered and found a way that worked for you! I find that working the stitches really tightly gives the shoes some good structure, but it definitely takes some getting used to. Thank you for sharing your tip! Hi I have a question for you. My mom is having some nasty swelling in her feet due to issues with her new prescriptions and I thought this would be a great idea for something for her to wear when her feet swell up, now because they are swelling up so much I had to buy size XL (11/12) womens flipflops for her to do this project. But how many holes would I need for this, 64 aren’t enough to go around doing the 1/3 of inch method or by going slightly less than 1cm, do you have any suggestions? Thanks!!! Hey Jess, I just fall in love with your boots and – surprise surprise – i have a pair of flip Flops here waiting. But, I want to crochet them with DK yarn. So is it necessary to change the number of stitches ? I like to use a 4,5 mm hook. Please excuse my english, I’m from Germany. I hope you are so kind to answer my question, because i can not wait any longer for crocheting this cute boots… lol ! Many many greetings from Germany !! I wish I could speak to how they will work with DK yarn, but I am just not quite sure since I haven’t tried it. I imagine you will need to adjust the pattern quite a bit though because it’s written with the idea you’d be using a pretty chunky yarn. The spacing of the holes on the soles is important to the gauge and yarn thickness though, so I would poke them closer together. Also, I have the Coachella Boots pattern which would work with two strands of DK yarn held together. That might be one to try that would require less tweaking. I hope that gives you some info to start with, Antje! I haven’t tried this pattern yet because I am unclear about a couple of things: #1- I wear a size 10 flip flop. What is the purpose using a shoe that is one size smaller? I guess maybe it would allow the crocheted portion to fit more snuggly, but wouldn’t there be overhang of the foot? #2- You say that for your project you used 64 holes, so for larger sizes space the holes slightly further apart. Does that mean doing so while still having ONLY 64 holes, or should I have more? I’d appreciate some clarification because I’m really excited to get started on these. The reason I suggest using a smaller flip flop is simply because there is often more sole overhanging your toes on a flip flop than is necessary for an actually shoe. You’re aiming for about .25″ around your foot of extra sole, so just choose whichever size accommodates that. Hope that answers your questions. Happy crocheting! Hi, I want to make a smaller size. Should I use smaller hooks or/and space the holes out more? Do you have a pattern for sizes 4-7? Hi, I’m making these as a gift and I’m so excited … I was just wondering in row 1 have written Ch1 then sc10… but in your video you just start with a sc into the sl st… so I was just wondering which I should do. I hope you can reply soon😬… thanks so much for sharing your gift! if you are going to give a free printable pattern you should include the tape measure with it for the markings, with doing so you may get more people come back to you site and possible purchase items, since you already got them to your site with a free pattern. Love you idea but do to not getting the tape measure for the pattern with the free pattern I will not be coming back to your site. We purchased your pattern, but it does not give the size differences for the stitches. We purchased a woman’s size 6-7 flip flop and using your hole guide, we have 54 holes punched on each flip flop. But when we look at the pattern and began the video, it is written for the larger size of 64 holes. What can we do? My daughter hopes to enter this in our county fair and she doesn’t have much time to complete them so I hope we can hear from ya soon:) THANKS SO MUCH FOR YOUR HELP! I hope I’m not answering your question too late! The county fair sounds fun! With most of my flip flop patterns, the pattern as it’s written is intended to make all the sizes, and then with some, there are additional specific directions for each size. Thank you so much for these! I can’t believe how quickly they worked up and how beautifully they came. I’m still rather a beginner and have mostly done blankets, so this was a really fun transition. I bought the pattern for the ruler but didn’t actually look at the rest and just used the videos and the instructions on the page. I used Buttercream Alpaca yarn in charcoal and a fibishibg needle instead of the B hook at the beginning, and they are fantastic!! I’m thrilled to hear that you enjoyed the pattern and that you’re so happy with your boots! It’s so fun to stretch your skills and then feel like you conquered something new, isn’t it? Happy crocheting on your next project! Good day, how can I have the tutorial videos made available to watch Offline as I do not have Internet or Wi-Fi access at home where I will be crocheting the boots. If I can download the videos and watch them offline it will help me a lot. This is my first time trying to crochet these fit flop boots. I do have the pattern but being able to go on the videos and fwd and rewind on them as I need to follow the steps will help me a lot! Please can you help me…I am left handed and can’t (understand) read a pattern. I am self taught and struggle along by watching Youtube – but have made some lovely things. I have asked for help but nobody can help me. I live in a little town in East London, South Africa. A friend wants me to try make her the boots that are on your site – I have tried to copy and paste the photo but am unable to do it…I only have the ref number set out here under. Its the boots with the 5 buttons down the back. Is it at all possible for you to do a tutorial on these boots – even if it’s for me…… I would be so grateful.. Were you able to see the video tutorial within this post (right above the pattern)? That should help you quite a bit. I mention how you’d change things for being left handed and the pattern includes notes for lefties as well. I hope that’s helpful! I have loved using your patterns for flip flop shoes. Every member of my family has a pair. I get huge comments everywhere I go. So question… people want to buy slippers from me. How do I go about giving your pattern credit as I do this? Most of my shoes are either gifts or I’ve been making them for our mission sewing circle at church for people in Africa. So getting paid is enticing and exciting. But I would never claim the pattern as my own and I want to give u credit. Let me know what the best way I can do that. Such cute boots, I have a bunch of dark purple wool that is just begging to be made into these slippers! I really like the flip flops into shoes concept, thank you for all of your lovely designs! Thanks so much, Jasmine! Purple sounds beautiful. I hope you enjoy them! Think I could make these with barefoot soles? They’re only 4 mm thick…. I have made 2 pairs of the cabin boots and the toe area puffs up so much, it makes them to big and loose. What am i doing wrong. Please help. So , I don’t have the time to read all the comments… I made a pair of these .despite being not too savvy on pattern reading I think I did sort of OK … my problem is that my feet are the size of a ten year old … and the boots are very Frankenstein looking… is there any chance you have stitch counts for a child size ( 2 or 3 US size ) or could you help me adjust the pattern slightly ?? Thanks !!! Hello Jess!! I love your work, but I have one question. Does it matter the type of yarn you use? Does it have to be chunky yarn or any size yarn will do? Thanks! Hi Jess and Thanks for making this pattern available for such a reasonable cost AND for the video to help me follow along. Ive had the yarn for a couple of weeks now. Im so afraid that I’ll go to all of this work and the stitches will just rip out of the flip flop! Is that an issue? I want to make these for my family for Christmas and have GOT to get going on these. Ugh Im such a worry bug! That’s a question a lot of people have actually. I’m wearing mine right now that I made a year ago and they’re still working really well. I wear them around the house as slippers and they sole is just starting to flatten a bit as flip flops do. The strands of yarn are still holding sturdy though. You can read a little more about how they hold up here too. Thank you so much, Gaby. I’m happy to have you here! Oh, My!!!! I just discovered your blog! Dang! Love , love, love!!! Can’t wait to read more! Can’t wait to wear these around campus! Hahaha! I’m glad you totally get it. This year has been warm enough for even the sane people to wear flip flops, but I think these boots are way comfier! Have you ever crocheted a lining into the boots? I haven’t yet, but a few people have with success. I know others have also cut a lining out of sheepskin or fleece. I wonder if something like the sole of the Sierra Slippers might be a good starting point for a crocheted insert? Hi I hate to say this since lots of others are having such fun with their boots. I tried and tried to decipher the instructions but nothing worked. I tried for 2 weeks to make a pair for my daughter and it just didn’t work out. Finally I asked a friend if she’d help me and she did but they turned out way too Big. Now it’s almost Christmas and I don’t have the gift for my daughter finished. Will you please rewrite the instructions for me to see if that helps? Several friends tried to help but could not understand the way it was written. Thanks for the help and I hope you can reply soon so that they may be finished while it’s still chilly outside. Or you could send me a finished pair which would be a size 91/2. For all this despair maybe you’ll send them free. my name is Gwynn Bedford, 956 Cty Rd 3, RR! Belleville, On. K8N4Z1. First off I want to thank you for making the video tutorials to go along with the pattern, that has helped me so much. Sometimes just seeing someone else do it really helps get past that mental block I develop all too often. I am struggling with the toe part of the boot, it is coming out really poofy, not at all flat like yours does and that you describe that it should. I have taken the stitches out, used a smaller hook and even decreased more times than you recommend and the result is the same. I have measured everything and my gauges are right, I am confused and frustrated. I really want to make these for my daughter – but continue to fail. Any suggestions? I’m so sorry to hear you’re having trouble. I know how frustrating that feels. If you’re willing to switch gears a bit, you might like the Breckenridge Boots pattern because the toe is deliberately a bit flatter. It uses the same gauge for the holes and same Wool-Ease Thick & Quick yarn, so you could just keep that foundation round you’ve already crocheted. If you want to keep going with the Cabin Boots, I’d recommend just really deliberately tightening your stitches around the toe and practicing making the decreases look as invisible as possible. To do this, I find that getting just the right amount of tension on the final yarn over (through both stitches you’re decreasing) helps to disguise it. I know that’s vague. Perhaps watching exactly how I’m doing it a few times in the video might help. Thank you for the super quick response! Can I use this pattern for the foot part of the boot then switch over to the Cabin Boot Pattern? If so where would I switch over? I think I may have found the problem as I tried the other pattern that you referred to and the same thing is happening. I am using a pair of size 5 womens flip flops and the toe is HUGE and shaped like a bubble instead of flat and tapered like what your pictures and videos show. Could it be the size of flip flop that is causing this issue? Do I need to add more decreases? I am sorry to be a pest, I really want to make these but they are frustrating me and I don’t want to give up. It seems a couple of the other ladies were having the same problem. What a neat idea! Who would’ve thought those cheap flip flops at Walmart could actually be put to some sort of good use? There’s no way I could ever make these myself, but it’s cool just to see that it can be done.